Starscape Video Slots Game – Game Review + Free Play! Taking a trip into outer space has never been as easy as this. Starscape, a new Microgaming release comes to you with beautiful graphics and animation with bright balls of sun, icy asteroids, globes and planets. Look out for those Spaceships, because if you get three or more of these scattered you will need to brace yourself for a trip into a new screen where you could be given the opportunity to pick up to as many as twenty block to match, and if you are very careful, you may even pick to block with the hidden multiplier which could land you up to as much as 37 500 coins. The Starscape logo is not a symbol to be overlooked, as they substitute and double your payline bet. Play this free game right here, right now! From our small world we have gazed upon the cosmic ocean for untold thousands of years. Ancient astronomers observed points of light that appeared to move among the stars. They called these objects planets, meaning wanderers, and named them after Roman deities such as Jupiter the king of the gods; Mars the god of war; Mercury the messenger of the gods; Venus the god of love and beauty, and Saturn the father of Jupiter and god of agriculture. The stargazers also observed comets with sparkling tails, and meteors and shooting stars apparently falling from the sky. Starscape will take you to heights never before achieved from the comfort of you own home as you play this amazing new addition to the Internet gaming. Maximum Jackpot – 7 000 coins x 10 coins per line = 70 000 coins in base game, 25 lines x 10 coins per line x 50 X 3 (multiplier) = 37 500 coins in bonus game. 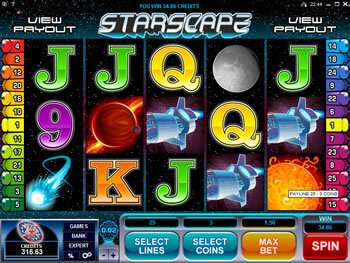 What are the Starscape Slot Paylines?